Flap copy ~ Little Bunny can sense something new in the air, and it smells like sunshine and warm breezes. "It smells like Easter!" his friends tell him. But Little Bunny wonders: what is Easter? So he sets out through the forest on an early spring day to find out. This sweet, simple story by Dori Chaconas conveys the spirit of the season through nature, while Margie Moore's gentle, detailed watercolors reveal the new life of springtime. Behind the scenes: When my editor at Albert Whitman & Company asked me to write an Easter story that wouldn't bring in the religious aspect, I was doubtful that it was possible. Easter means the Risen Christ to me, and all the candy and chocolate bunnies are only a commercial enhancement. But I wanted to try, and so I thought about the Resurrection... how Christ arose to new life, symbolized by Spring, nature in bloom, and rebirth. I hope the idea of this simple book, that new life in nature parallels the Resurrection, offers an opening to talk about the real meaning of Easter. 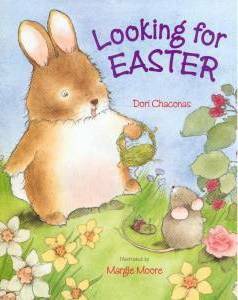 Booklist: Chaconas tries something a little tricky: She introduces the spirit of Easter without religious association and without the Easter Bunny. True, this stars a rabbit, but Little Bunny is just a brown, furry fellow living in a meadow, enticed by the smells of fresh air and flowing water. Beaver says that those smells are the scent of Easter and that Easter is a basket. So Bunny gathers twigs and reeds and makes a basket. Woodchuck says Easter is fresh grass; Mouse says it's sweet berries. Bunny generously gives the now-filled basket to Robin, who needs a place for her eggs. Retreating to his cave, Bunny resigns himself to having given Easter away. Then, Wren takes Bunny to see Easter--baby robins, woodchucks, mice, and beavers. Easter? "Easter is new life... Easter is all around us today." Although some may object to the missing Christian aspects, the loving feel of this certainly says Easter is more than decorated eggs. The simply drawn woodland animals washed with watercolors will attract little ones.